Baseball is everywhere ... even where it isn't. Let me explain. The incomparable Prints and Photographs Online Catalog of the Library of Congress includes a treasure trove of baseball images. Go to the site's search page, enter the keyword "baseball," and the massive database will return over 7,200 results. While that sounds like a lot of baseball images, it's a drop in the bucket when you realize that the Library has digitized well over a million images ... and that there are more than 14 million items in their Prints and Photographs Collections in total. At first glance the photo doesn't appear to have anything to do with our national pastime. But take a careful look in the background and you'll notice that amid the clutter of postcards and calendars, dozens of baseball cards are affixed to the busily-decorated walls. 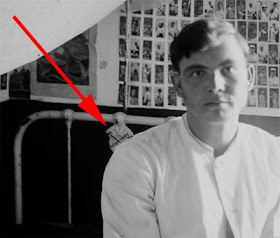 Little is known about this photograph and this is reflected in the minimal metadata that accompanies the image. Other than a non-contemporary title devised by the Library's staff ("Young man in dormitory room") and a rather broad estimate that the photo was taken sometime between 1910 and 1920, the Library of Congress provides no other details. Thankfully, a few members of the wonderful Shorpy photo blog have made a bit of headway researching the photo. 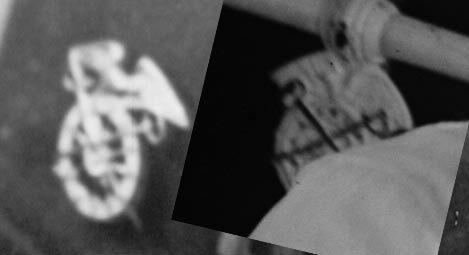 Most significantly, one eagle-eyed researcher noted that a crest seen at the end of the young man's bed frame resembles the insignia of the Quartermaster Corps. The insignias are essentially identical: an eagle with its wings spread perched on a wheel over which a sword and a key are crossed diagonally. (More information about the Quartermaster insignia can be found in Encyclopedia of United States Army Insignia and Uniforms.) This suggests that the photo may have been taken at the Quartermaster Corps School in Philadelphia, its location from 1910 through 1917. As for the baseball cards, there are well over six dozen of them adorning the wall in this young man's room. Who knows how many may be hidden from view or attached to the other walls? Every one of the baseball cards that is visible comes from one of two well-known sets that were issued as premiums in cigarette packages: T205 (Gold Borders) and T206 (White Borders). 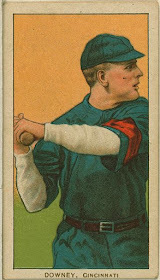 The T205 set of over 200 different cards was produced in 1911, while the T206 set that numbers well over 500 cards was produced between 1909 and 1911. Given the presence of cards from the T205 set, we can now establish that the photograph was taken no earlier than 1911. Additionally, two calendars in the background also provide clues. 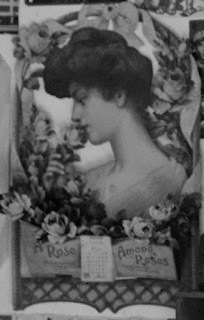 One of the calendars is titled "A Rose Among Roses" (seen below, at left) and is displayed showing May of 1910. 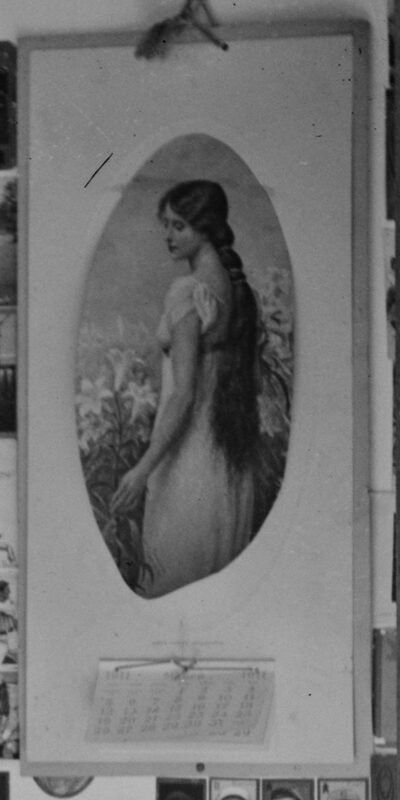 The other calendar (seen below, at right) is showing March of 1911. Of course, neither calendar provides a definite date for the photo, but it certainly suggests that the photograph was taken no earlier than March of 1911. Though most of the cards are slightly out of focus and some do not reveal unique features, the vast majority of these cardboard mementos can be definitively identified. The small group of four cards at top left are quite out of focus and were a bit of a challenge to identify. The cards are (top to bottom; click on the linked player names below to see their corresponding baseball cards at the Library of Congress web site): T205 Mickey Doolan (Philadelphia NL), T206 Tom Downey (Cincinnati NL), and T205 Cecil Ferguson (Boston NL). The fourth card is a rather generic T206 portrait with hardly any details whatsoever. While I cannot state for certain, I think it is a good possibility that the card may be of Ty Cobb (Detroit AL). The Downey card is particularly interesting in that it depicts the Reds shortstop wearing an all-blue uniform. But that is historically accurate, as the Cincinnati club wore that seemingly incongruous color scheme on their road duds from 1900 to 1903, 1909 to 1911, and 1913. That's somewhat historically accurate. Following the death of National League president Harry Pulliam in late July of 1909, the Reds, along with every other National League club, honored the memory of the executive by wearing black armbands. The artist for the T206 cards, however, took some liberties and opted to paint the armband a more artistically arresting red. The lone card seen directly below Group A is clearly a portrait from the T205 set, but it is extremely difficult to state for certain exactly who is depicted. 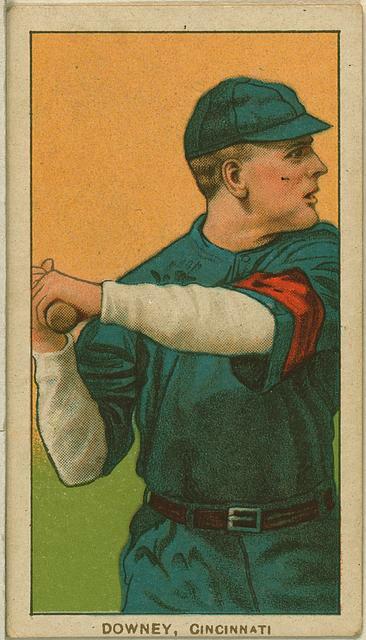 A best guess is that the card shows third baseman Bobby Byrne (Pittsburgh NL). Top row (left to right): T205 Chief Wilson (Pittsburgh NL) and T206 Admiral Schlei (New York NL). Second row (left to right): T205 John McGraw (New York NL) and T206 Ed Konetchy (St. Louis NL). Third row (left to right): T205 Art Devlin (New York NL), T205 Larry Doyle (New York NL), T205 Cecil Ferguson (Boston NL), T205 Frank Chance (Chicago NL), and T205 Bill Foxen (Chicago NL). Fourth Row (left to right): T205 Deacon Phillippe (Pittsburgh NL), and T205 Ed Konetchy (St. Louis NL). Many of the T205 images are based on photographs taken by famed baseball photographer Paul Thompson in 1910. As an example, I've overlaid Thompson's photographs of rival managers John McGraw and Frank Chance atop their corresponding baseball cards. (Click on the linked names of these managers to see their corresponding Paul Thompson photographs at the Library of Congress web site). Note that while the faces match perfectly, portions of the uniforms have been altered by the baseball card artist. To the right of Group C is a trio of cards that includes (top to bottom): T205 Art Fletcher (New York NL), T205 Gabby Street (Washington AL), and T205 Tom Needham (Chicago NL). Below Group D are seven T205 cards (left to right): Al Bridwell (New York NL), Fred Clarke (Pittsburgh NL), Christy Mathewson (New York NL), Bob Ewing (Philadelphia NL), George Gibson (Pittsburgh NL), Frank Chance (Chicago NL), and Tony Smith (Brooklyn NL). Top row: Howie Camnitz (Pittsburgh NL), Danny Murphy (Philadelphia AL), Jeff Sweeney (New York AL), Patsy Dougherty (Chicago AL), Bill Bradley (Cleveland AL), Orvie Overall (Chicago NL), Hal Chase (New York AL), Heinie Berger (Cleveland AL), Rube Geyer (St. Louis NL), George Bell (Brooklyn NL), Red Ames (New York NL), Christy Mathewson (New York NL), Cy Young (Cleveland AL), and Jimmy Sheckard (Chicago NL). Second row: Fred Payne (Chicago AL), Ed Konetchy (St. Louis NL), Joe Tinker (Chicago NL), Harry Davis (Philadelphia AL), Harry McIntire (Brooklyn NL), Rube Oldring (Philadelphia AL), Vic Willis (St. Louis NL), Bill Bradley (Cleveland AL), Frank Chance (Chicago NL), Josh Devore (New York NL), Hugh Duffy (Chicago AL), and Chick Gandil (Chicago AL). Third row: Ed Reulbach (Chicago NL), Orvie Overall (Chicago NL), Joe Tinker (Chicago NL), George Bell (Brooklyn NL), Mickey Doolin (Philadelphia NL), Doc Crandall (New York NL), George Bell (Brooklyn NL), Fred Payne (Chicago AL), Gabby Street (Washington AL), and a card to be discussed below. Fourth row: T205 Frank Chance (Chicago NL), Joe Lake (St. Louis AL), Josh Devore (New York NL), John Hummel (Brooklyn NL), Ed Reulbach (Chicago NL), Heinie Berger (Cleveland AL), Doc Crandall (New York NL), Doc White (Chicago AL), and Hal Chase (New York AL). Bottom row: T205 Davey Jones (Detroit AL), Frank Chance (Chicago NL), John Frill (New York AL), Kid Elberfeld (Washington AL), Vic Willis (St. Louis NL), George McQuillan (Philadelphia NL), Zack Wheat (Brooklyn NL), Charley O'Leary (Detroit AL), Ed Foster (Charleston, SC, South Atlantic League), and Johnny Evers (Chicago NL). Some of the card identifications were quite simple. For example, in the detail below, the trio of images are easily matched to their T206 cards: Christy Mathewson, Cy Young, and Jimmy Sheckard. Some cloth overhanging the bed obscures all but the bottom right-hand corners of the top two cards on the left, but careful research revealed matches with T206 cards of Howie Camnitz and Danny Murphy. The young man's head obscures all but the top left portion of the card at far right in the second row and the bottom left-hand corner of the card at bottom right. Still, just enough of these images were visible to match them to known cards of Rube Oldring and Mickey Doolin. One of the cards in Group F did not match any known T206 or T205 baseball card. It is the far right-hand card in the third row. After a good deal of research, however, the mystery was solved. The card was not of a baseball player, but of a young woman, part of a series issued in 1910 and today designated as the T106 set of "State Girls." In this case, the card was "Alaska Girl." Just why Alaska was featured as a part of the series is unknown, since it would not be until 1959 that the territory would gain statehood. 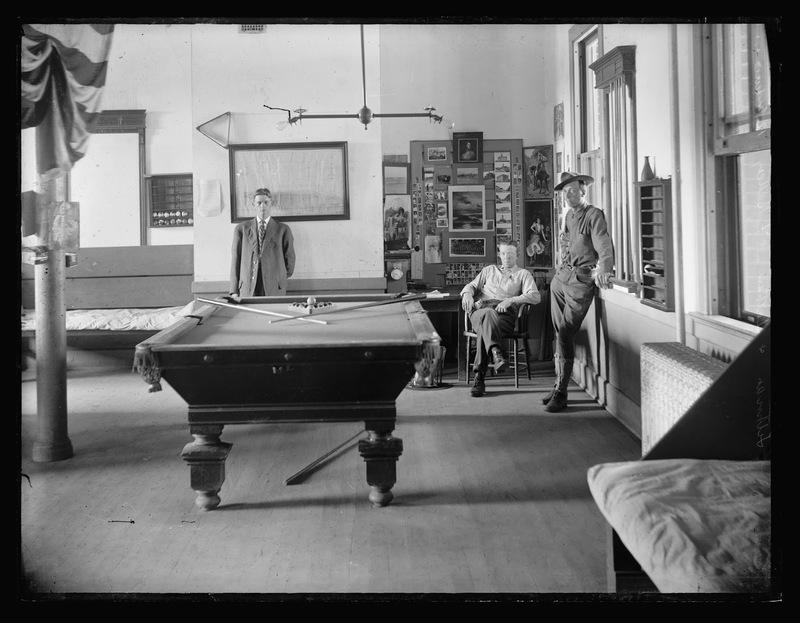 Below is another photograph from the National Photo Company Collection that is not tagged with the keyword "baseball," yet contains the same baseball content as in the "dormitory" photo: baseball cards. 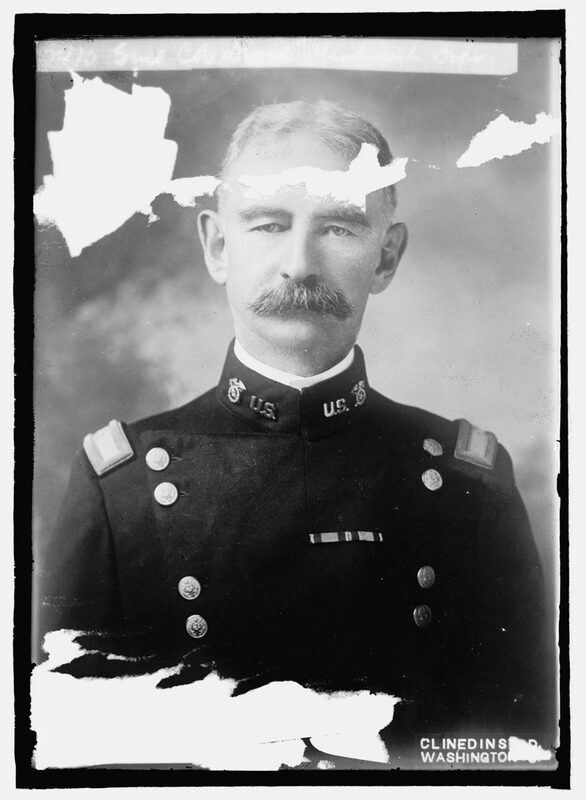 As was the case with our first photograph, the Library of Congress's metadata sheds little light on the image. 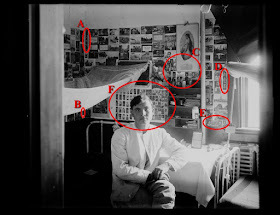 It is titled "Lithnan & Latham, F. Baltcry 12 Peduri," but surely much of this jibberish is a misreading of what is written on the original negative (at far right on the original photograph). For example, close examination of "F. Baltcry" reveals that what is actually written is "F Battery." And "12 Peduri" may in fact be "12 Pictures." Still, the handwritten information is difficult to decipher. Additionally, the staff's estimate for the date the photo was created is essentially useless: 1910 to 1935, a whopping 25 year span! In short, as with our previous photo, we know very little about this image ... except, of course, that there are lots of wonderful baseball cards in the background. Each of the cards seen in this photograph belongs to the T206 "White Borders" set, and many depict players with minor league clubs from the American Association and Eastern League. The cards are found in three large groupings. A group of cards can be seen just above the right side of the billiards table, each one identifiable except for the bottommost card, which is obscured by a dark spot (perhaps a flaw in the emulsion). The cards are (top to bottom, left to right): Del Howard (Chicago NL), John Anderson (Providence, RI, Eastern League), Harry Krause (Philadelphia AL), Jimmy Slagle (Baltimore, MD, Eastern League), George Ferguson (Boston NL), Ray Demmitt (New York AL), Miller Huggins (Cincinnati NL), Bud Sharpe (Newark, NJ, Eastern League), Harry Gaspar (Cincinnati NL), Danny Moeller (Jersey City, NJ, Eastern League), Paul Davidson (Indianapolis, IN, American Association), Jake Atz (Chicago AL), Harry Krause (Philadelphia AL), Lou Fiene (Chicago AL), Jack Hannifin (Jersey City, NJ, Eastern League), and Bob Groom (Washington AL). At the far right is another group of cards displayed vertically. These cards are (top to bottom, left to right): Jean Dubuc (Cincinnati NL), Donie Bush (Detroit AL), Spike Shannon (Kansas City, MO, American Association), Ossee Schreckengost (Columbus, OH, American Association), Hal Chase (New York AL), Jean Dubuc (Cincinnati NL), Ted Easterly (Cleveland AL), Pete O'Brien (St. Paul, MN, American Association), Chappy Charles (St. Louis NL), Harry Howell (St. Louis AL), Dode Paskert (Cincinnati NL), Newt Randall (Milwaukee, WI, American Association), Dots Miller (Pittsburgh NL), George Perring (Cleveland AL), Deacon Phillippe (Pittsburgh NL), Ray Demmitt (New York AL), and Roger Bresnahan (St. Louis NL). Top row: Oscar Stanage (Detroit AL), Ed Willett (Detroit AL), Boss Schmidt (Detroit AL), Ed Willett (Detroit AL), George Hunter (Brooklyn NL), unidentified actress?, John Ganzel (Rochester, NY, Eastern League), Sam Strang (Baltimore, MD, Eastern League), Steve Evans (St. Louis NL), Tris Speaker (Boston AL), and Jimmy Slagle (Baltimore, MD, Eastern League). Second row: Dolly Gray (Washington AL), Jack White (Buffalo, NY, Eastern League), Jack Hannifin (Jerysey City, NJ, Eastern League), Bob Bescher (Cincinnati NL), Joe McGinnity (Newark, NJ, Eastern League), unidentified actress?, Dan McGann (Milwaukee, WI, American Association), Jack White (Buffalo, NY, Eastern League), and Jimmy Collins (Minneapolis, MN, American Association). Bottom row: Beals Becker (Boston NL), Nick Maddox (Pittsburgh NL), Shad Barry (Milwaukee, WI, American Association), Bill Abstein (Pittsburgh NL), Jean Dubuc (Cincinnati NL), Heinie Zimmerman (Chicago NL), Ted Easterly (Cleveland AL), Deacon Phillippe (Pittsburgh NL). Scores of wonderful baseball cards on photographs from a century ago that otherwise have nothing to do with baseball. It just goes to show that baseball is everywhere ... even where it isn't. Fantastic work as always Tom, the LOC sure has some treasures in its photo archives. Tom, This is an amazing piece! Excellent research as always. Terrific work and a wonderful piece to read and ponder. Thank you! I love seeing the original context for how T205 and T206 cards were displayed so casually. Tremendous research once again, Tom, and spectacular graphic presentation!